Riverside Park Veterinary Clinic is a full-service veterinary medical facility located in Grants Pass, OR. The professional and courteous staff at Riverside Park Veterinary Clinic seeks to provide the best possible medical, surgical, and dental care for their highly-valued patients. We are committed to promoting responsible pet ownership, preventative health care and health-related educational opportunities for our clients. Riverside Park Veterinary Clinic strives to offer excellence in veterinary care to Grants Pass and surrounding areas. Please take a moment to contact us today to learn more about our veterinary practice and to find our more information about how Riverside Park Veterinary Clinic can serve the needs of you and your cherished pet. Dr. Ron was born and raised in "America's Dairyland" Wisconsin. He attended the University of Minnesota where he earned his degree in 1981.After practicing in Wisconsin and California, Dr. Ron moved to Oregon in 1996 and became an associate at the clinic. In 1998 he purchased Riverside Park Veterinary Clinic and has expanded the practice to include 5 associates. In addition to internal medicine, Dr. Ron has a strong interest in both soft tissue and orthopedic surgery. Dr. Ron and his wife Tanya, enjoy spending time as "empty nesters" as their son Jonathan attends OSU perusing an engineering degree. Ron's other interests include fly fishing, vegetable gardening and watching the Green Bay Packers. The Guzman family have 3 cats and 1 dog. Dr. April ia a California native and attended UC Davis where she earned her B.S. in Zoology(1991) and her veterinary degree in 1995. Her professional interests include internal medicine, clinical pathology(analyzing lab work),and educating our clients about preventive medicine. Dr. April joined Riverside Park Veterinary Clinic in 2002 and has been a great addition. Her personal interests include reading, learning Italian, gardening, running and playing the guitar. Dr. Stephanie Rosenaur was born in Michigan and lived there until she was 27 years old. She has two sets of parents with 5 siblings between them. She was raised in a house in the city with no pets until she started trying to bring animals home. She only ever succeeded in having 2 outside cats, 1 fish tank and the class Guinea Pig during the summer. She finally was allowed her dream pet, a horse, which she was allowed to lease when it was not being used for summer camp. She had this horse through all her teenage years. She waited all year each year to go to summer camp where she rode horses and played with the farm animals. At 7 years old, she decided to become a Veterinarian. She attended some unique and amazing schools during elementary, middle and high school that encouraged academics but also the liberal arts. She pursued pre- Veterinary Medicine at a private, liberal arts college in Ohio, that also happened to have an amazing Equestrian program. She took time to pursue the liberal arts as well, such as piano, more French and Kinesiology. In her third year of undergraduate studies, she was accepted into the College of Veterinary Medicine at Michigan State University. Dr. Stephanie received her Doctorate of Veterinary Medicine from there in 1999. Her focus was large domestic animals and exotic/zoo/wildlife medicine. Dr. Stephanie's first job was working at a small/exotic animal hospital for her hometown's Zoo Veterinarian. Her day off was scheduled on Zoo rounds day so she could work with those animals as well. In 2002, she decided to take an adventure and moved to Southern California on her own to work at a small/exotic/mixed animal practice. She met her husband, an Exotic/Wild Animal Trainer for the Motion Picture Industry. They have a daughter who is nearly as busy as they are with school,sports and her animals. 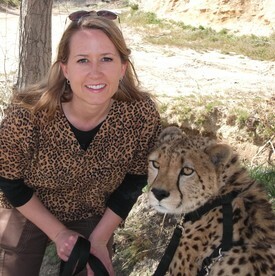 Her husband owns these exotic animals so Dr. Stephanie has a ranch full of domestic and exotic animals for whom she also provides veterinary care. Dr. Stephanie's family decided to move to Oregon in 2012 with plans to start a Safari Bed and Breakfast on their 680 acre ranch. With a huge ranch and a multitude of animals, the move has taken over 2 years and is not complete. Initially, she commuted by airplane to her hospitals in CA for work. She started working at Riverside Park Veterinary Clinic in February of 2015. Dr. Stephanie has many interests. She and her daughter started Fancy Foo Foo Rabbitry and breed and show Lionhead, Holland Lop and Velveteen Lop rabbits. She spends her free time with her family and doing "ranch chores" for their many animals. Subjects she loves and pursues if given a spare moment are interior decorating, music, exotic/zoo/wildlife medicine and horseback riding.